Millennials are a force to be reckoned with. 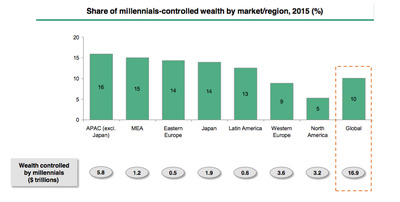 A tenth of global wealth, or $16.9 trillion, is held by millenials, according to a BCG Global Client Discovery Survey out on Tuesday. This number is expected to grow to an incredible $35.3 trillion by 2020. 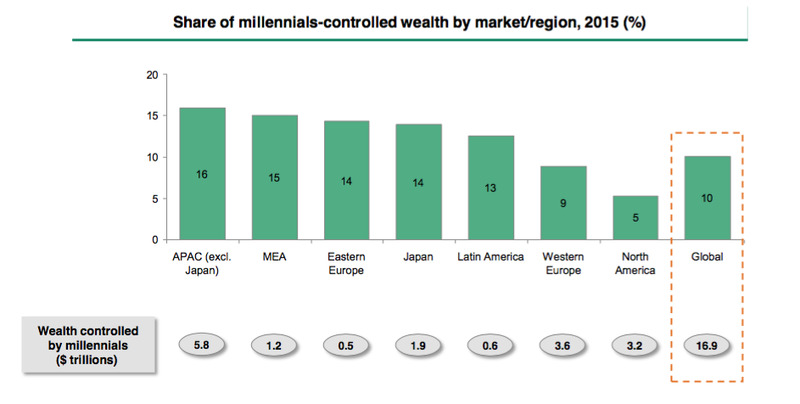 The rate of growth in wealth for millennials is more than twice that of the global wealth growth average. And that presents a huge opportunity for money managers around the world. Banks and wealth managers, which have traditionally divided their clients by wealth and asset allocation, have started thinking about nontraditional segments like women and millennials and focusing on the associated behaviours that relate to those groups. And that means adapting to meet their expectations. 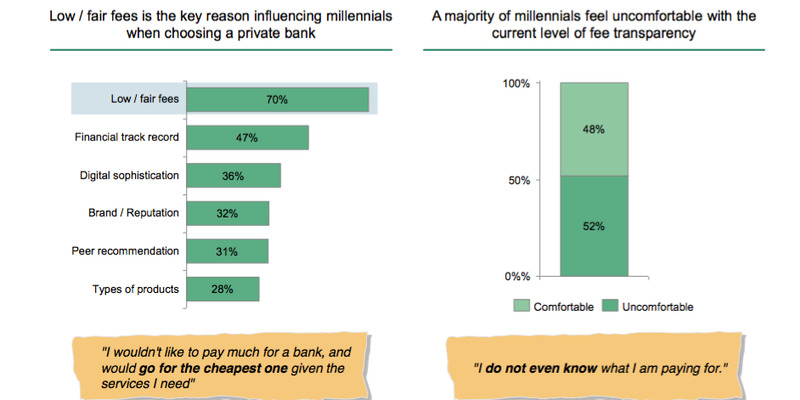 Millennials tend to be focused on transparency, along with fair and low fees, when choosing a private bank, according to the BCG Survey. 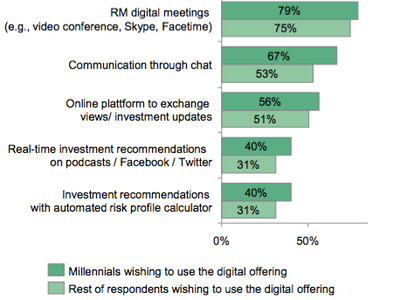 Millennials also have a stronger preference for digital offerings than other segments, and would prefer to speak with relationship managers over Skype or Facetime rather than in person, according to the survey. They want an online platform and real-time investment recommendations via Twitter, Facebook and podcasts, according to the survey. Banks are trying to close the gaps to capture this millenial opportunity both by developing capabilities in-house and, in particular, through acquisitions. 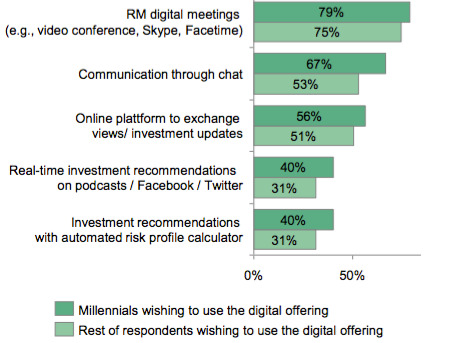 BCG Global Client Discovery Survey, 2016; BCG analysisMillennials prefer digital products. according to Anna Zakrzewski, partner and global topic expert at BCG. When the plan finally rolls out, it’s already too old to be relevant, she said. That is where fintech companies come in. A bunch of millennial-focused wealth management startups have launched over the past five years, such as Acorn, Betterment, Wealthfront, and SigFig. They offer many of the services millennials prefer, such as low cost investments, online platforms and automated risk profile calculators. Wealth managers are increasingly acquiring or partnering with these firms, taking the best of what these more nimble startups have and offering it to their well-developed client base. Blackrock for example acquired FutureAdvisor, while Northwestern Mutual acquired LearnVest. Millenials are a market not to be ignored, and Wall Street is taking notice.